Posted on Wed, Mar 21, 2012 : 8 a.m.
You may remember that my friend Sassa, who is from Sweden, took me on a grand food tour of IKEA recently, which was wonderful fun! I bought some lovely anchovies, prepared to come home and cook with them. But then I had trouble with my oven, which was ultimately replaced. So now I can actually prepare more than just sandwiches to pay tribute to Swedish cuisine! This baked salmon dish is ridiculously easy to make, and yet unbelievably flavorful. It was inspired by a dish in IKEA's Real Swedish Food Book — a collection of traditional recipes and beautiful photographs that Sassa very sweetly lent to me. The original recipe called for spreading anchovy butter over gravlax (cured salmon); but since I had a beautiful fresh salmon filet at my disposal, it only made sense to use that instead. 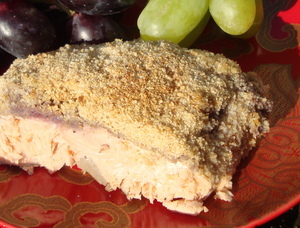 In this recipe, a few simple ingredients — gorgeous salmon, intensely flavored anchovies, vibrant red wine, strong mustard, rich butter, crunchy breadcrumbs — transform themselves beyond their basic essences into a vividly delicious dish. The anchovies do not overwhelm everything else. Instead, they offer a depth of flavor, just as they do in a Caesar salad dressing or in my Pasta con Aglio e Olio (in which the small fish simply melt into the garlic-infused oil that pasta is tossed in). The preparation of this dish is typically Swedish, allowing the essential elements to shine without being masked by heavy sauces or multitudes of toppings. This simple entree isn't supermodel photogenic, what with its schmear of purple sauce and its beige bread crumb topping. But it offers enough flavor that you'll still be utterly smitten by it anyway. Preheat oven to 400 degrees. Lightly grease a 9x13-inch baking dish, and place the salmon into it skin-side down. In a small skillet, saute the onion, anchovies and red wine over medium-high heat, pressing down to mash the anchovies, until most of the liquid has been absorbed (about 5 minutes). Stir in the butter, mustard, salt and pepper. Spread the onions over the salmon, then sprinkle the bread crumbs over the fish. Bake for 25 minutes until the fish is fork tender. To read about my adventures as a judge at Piepalooza, a fabulous fundraiser to support the Perry Nursery School for at-risk children, visit my blog - Food Floozie.